The Road Ruiner was responsible for this better-than-expected Roads Scholaring. These photos consist of Southgate - and nothing but. Let's rock down to Electric Avenue! This is northwest at the end of that road. Electric Avenue used to continue straight ahead. 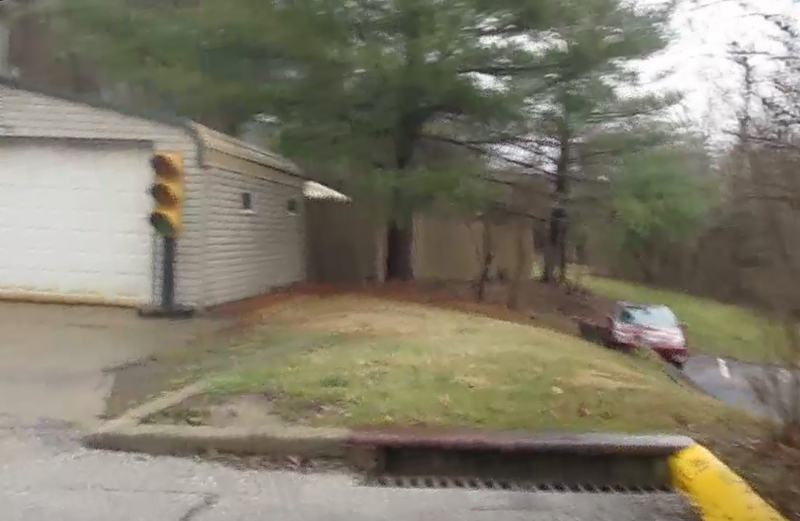 Whoever owns that garage might be a Roads Scholar, since they have an old traffic light there. Southeast on Electric at Bluegrass Avenue. What's interesting here is the sign with the road name. I bet it's very old. It even uses the old block font. If it's as old as I think, they've taken mighty good care of it. Looking up Harvard Place. The yellow sign is one of those old embossed types - probably from the 1950s. Hard to believe Southgate had at least 2 of these still standing in 2017! You don't have to divide by 5 to save lives! 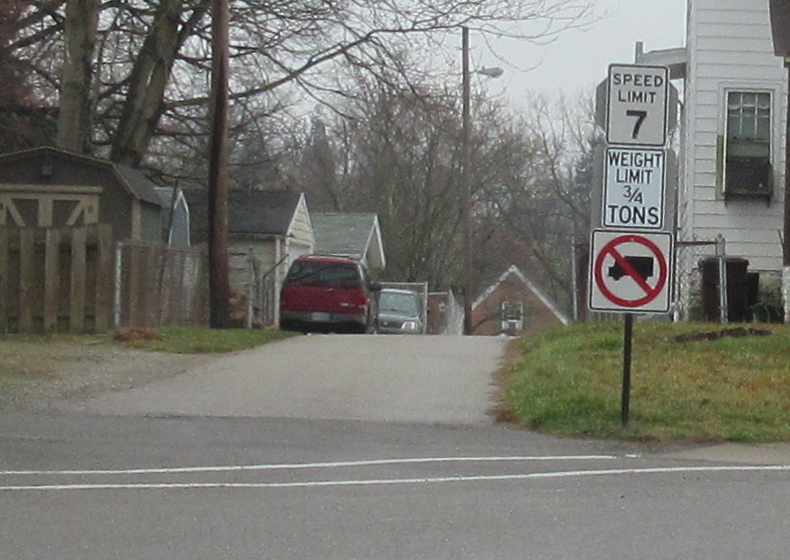 This unusual SPEED LIMIT 7 sign is southeast on an alley off Walnut. Northwest on Ridgeway from Walnut. 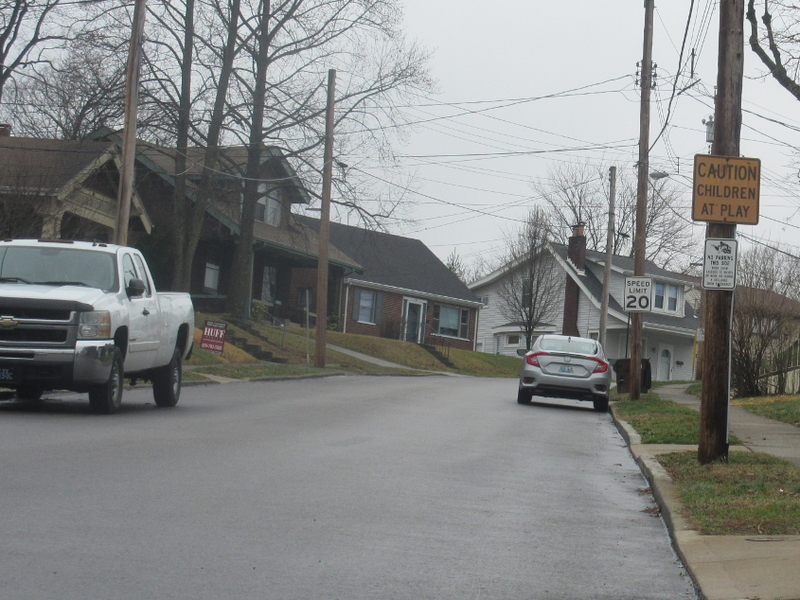 This is another of those 60-year-old yellow signs in Southgate that have weathered the test of time. A video of the Road Ruiner violating an Allowed Cloud! (Using it at all violates an Allowed Cloud!) Orchard Street is a public street, but there's a sign posted that forbids anyone except residents from using it. So I used it. Cope. 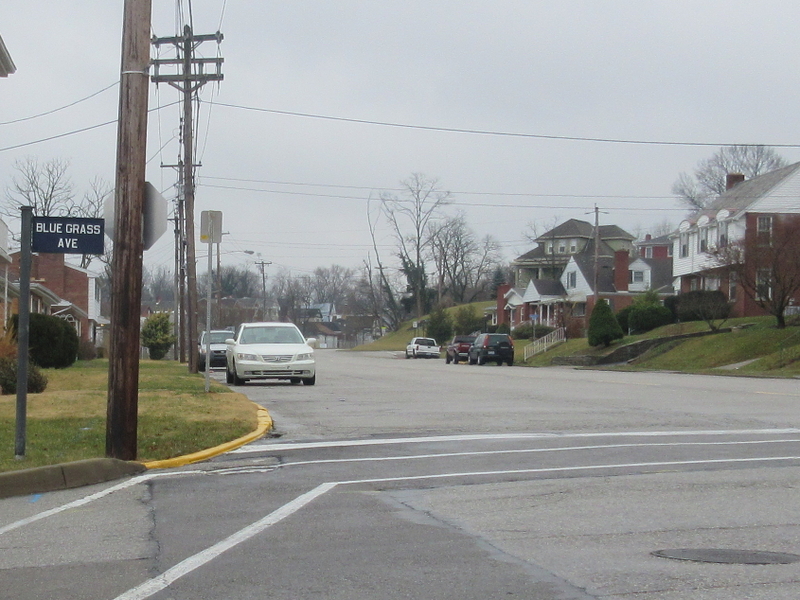 Also, Orchard Street used to continue through where the church parking lot is now, all the way to US 27. That was at least as recently as the 1990s. Southgate channels Virginia Beach. I also love how Southgate thinks it operates its own prison system. 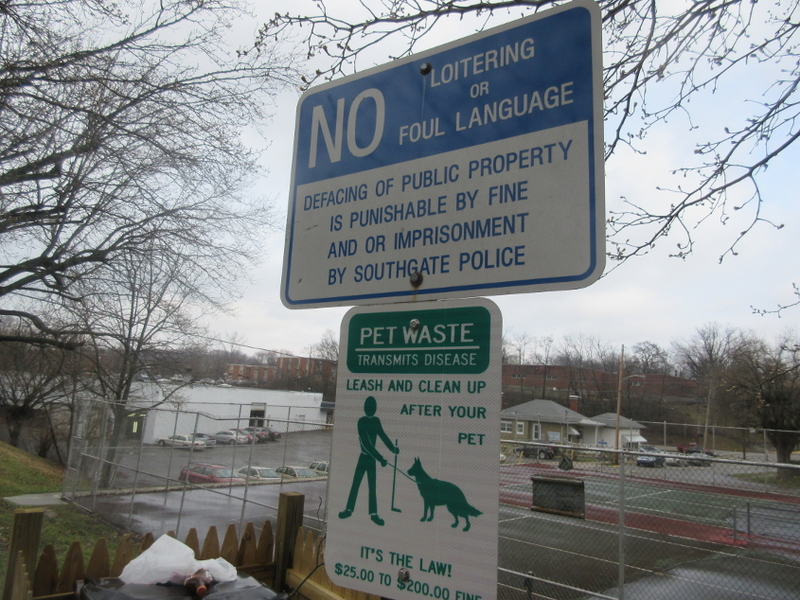 And how can they prohibit loitering at a park bench? That's what the bench is for! This photo is at the benches along Electric Avenue. We're looking out over a tennis court, and in the background on the right, we see the intersection of Evergreen & Willow. West on Snowshoe Drive at Winterview Lane. 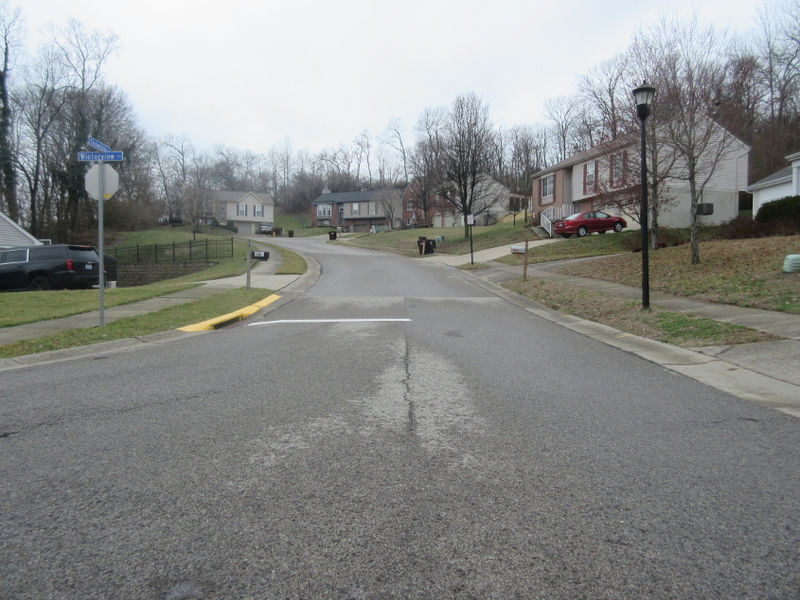 This subdivision probably dates from the 1990s. (My bicycling days just missed the era of Fort Beech Drive being free of development.) The reason I got this is because I heard police kept chasing everyone away from Snowshoe Drive - even though it's public. This was a theme throughout this outing. 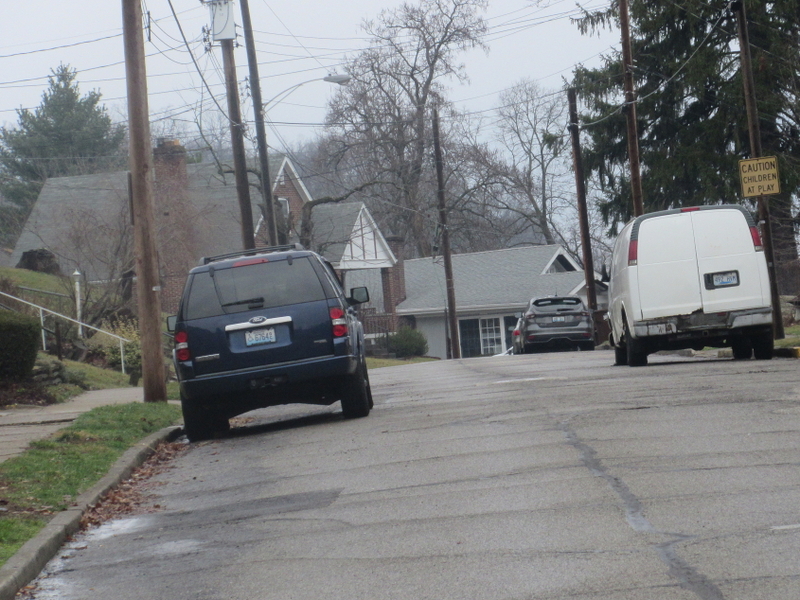 I also noticed a couple places on this outing where public rights-of-way were improperly marked as private driveways. One was part of the old Cherry Street.